PressureTrace II Manual - (11/18/09) Documentation for the PressureTrace II system. Adobe reader is required to view the file. To upgrade your docs simply download this file and place it in your "Documents/PressureTrace Files" folder. PressureTrace II Bluetooth Connectivity - (11/16/09) How to connect PressureTrace II to a PC via Bluetooth. Adobe reader is required to view the file. Drivers Drivers Drivers - A Fix is on the horizon, maybe! A steady growth of features means Bluetooth now touches nearly all parts of the Windows OS. Out of date or conflicting third party drivers has caused myriad problems. You may have noticed the most common bluetooth chips from Widcomm/Broadcom are no longer supported directly at their web site. The Broadcom web site instead refers you to Microsoft and Windows Updates. Microsoft is now supporting most common Bluetooth chipsets directly as part of the Windows 10 operating system. This should be a big positive for Windows users and why we have long recommended buyng dongles advertised as "not requiring drivers". Driver updates are then transparently downloaded with other OS updates. These changes are also impacting Windows 7 and 8. We recently noticed Broadcom drivers would no longer work on an older Dell running Windows 7 after a Windows update, even though they were still the recommended drivers on the Dell support page for the old computer. If you experience problems paring to PressureTrace with third party drivers recommended by the PC or dongle manufacurer, for Windows 7, 8 or 10, you may try switching to the Microsoft drivers. Delete the paring to PressureTrace then use your control panel to uninstall all third party Bluetooth drivers from the computer and reboot. After reboot with the Bluetooth hardware installed (dongle or internal), run the Windows update to ensure the Bluetooth code stack is also installed. Add a new paring to PressureTrace (don't forget the "1234" code if asked) and allow Windows to search on-line for drivers. Your com port assignments may change but all should work. This fixed several systems here that had been running old Widcomm/Broadcom drivers. Success will not doubt depend on your Bluetooth chip. Normally only third party firewalls interfere with Bluetooth communication. The standard Windows firewall should not cause any problems. If you receive an occasional illegal communication error, and are running a third party firewall, open your firewall control panel and add the PressureTrace II software to the list of exceptions (programs allowed to use com without interruption). Only one Bluetooth dongle should be used on a system that is not equipped with internal Bluetooth. Use of multiple dongles (or a dongle with internal Bluetooth) is not supported by Windows. Once pared to the PressureTrace module, most dongles will create a different Com port if plugged into a different USB port, so always plug the dongle into the same USB port used when establishing the original paring. If you know your Bluetooth drivers are current and for some reason the com port keeps changing so the PressureTrace software will not connect, Windows or Bluetooth driver updates may have added too many com ports or duplicate com ports. This may have occurred after a Windows update or driver update. To check, clean or reduce the number of com port assignments follow the instructions under "How do I clear old Bluetooth dongle Com Port assignments that are no longer used?" below. PressureTrace USB or Serial Software v. 4.50 for Windows XP & Vista - (Released 1/20/08) This is the last software release for old serial and USB PressureTrace systems. It will work for Windows XP, Vista or Windows 7 32 bit and 64 bit versions of Windows through Vista. USB or Serial PressureTrace Docs - Current PressureTrace documentation and help as an Acrobat Reader file. It is the same as included in the above file but can be printed via Acrobat Reader. USB 64 Bit Drivers - These drivers will work on 64 bit XP and Vista systems and all 32 bit versions of Windows. Unzip the file. Plug the PT module into a USB port and when the hardware wizard runs, point it to this driver folder and allow the drivers to load. The wizard should run twice to install one driver set under "Ports" in the device manager and another under "Universal Serial Bus Controllers". Windows may assign a new com port to PressureTrace. Check the PT Settings.INI file located in the Documents/PressureTrace Files folder (double click will open it in Notepad) to confirm it is the same com port assigned in the device manager. Notes RE Windows 7: The USB chipset used in PT USB is no longer supported by the manufacturer so signed drivers are not available for the 64 bit version of Windows 7. Windows 7 64 bit does not allow installation of unsigned drivers. This leaves us unable to publish drivers that will work with Windows 7 64 bit. PressureTrace software versions older then 4.5 were not Vista or Windows 7 compliant. Before you launch any old release on Vista, it is highly recommended you uninstall the PressureTrace software and upgrade to the 4.50 version. Here is data from SAAMI relating maximum pressures to velocity and bullet weight for handgun and centerfire rifle calibers. No propellant information is provided but the data is useful for determining what velocity might reasonably be achieved for a given bullet weight at Maximum SAAMI pressure. Note the handgun barrels may be longer than typical and because the tests followed SAAMI protocols pressures are likely to be higher than would be achieved in a production rifle. The left hand pressure column labeled "Maximum Average Pressure" is the one normally quoted as maximum for the caliber. My PTII module does not show a sync light or all three lights are on? My PC does not have Bluetooth. How can I run PressureTrace II? How do I clear old Bluetooth dongle Com Port assignments that are no longer used? My barrel is stainless, does that make a difference? What causes traces with flat tops? What power sources can I use to eliminate the batteries? Can I use PressureTrace for 22 Rim Fire? After I took a shot all I had was a low level line on the chart. The PressureTrace program displays "Calibrating" but never displays "Waiting for the shot". How can I move strain gages to other firearms? Must the gage be glued to the center area of the chamber? I already have gages glued on my guns. Do I need to replace the gages I already have? My double barrel shotgun has a flare near the breech right over the chamber. Will PressureTrace work? I own a Savage rifle or AR with barrel tube. Will it work with PressureTrace? How critical are barrel measurements and what is the best way to measure the inside chamber dimension? When I enter velocity the bullet exit point always shows remaining pressure. Why is this? How long should batteries last? Can PressureTrace software run on old versions of Windows? Why do some traces look as if they are delayed? Will increasing the trigger level loose data? What makes traces look jagged or "saw toothed"? What are the known product warranty issues and how are they fixed? How can I hide the strain gage? When the module is turned on it will only show the power light. If the module has been successfully pared with Bluetooth or after launching the PT software the synchronized light will turn on to confirm two way communication with the module. The software will then calibrate and display "Press [Shoot] when ready". First, always ensure you have assigned the correct com port and your drivers are current. If an incoming and outgoing port is assigned to PressureTrace, the correct port to use will always be the "Outgoing" port. If current drivers do not resolve the problem or other light behavior is displayed, the module firmware may be damaged and you may need to restore the firmware. Security equipment used to X-Ray shipping containers can damage the firmware. This is definitely the problem if all three lights remain on. To restore the firmware, download the the PTFlash utility here and follow the instructions. If your PC has a USB port all you need is a "Bluetooth Dongle" available on Ebay for as little a 99 cents and most computer stores for under $20. It is recommended you buy a current dongle that supports Bluetooth 2.1 + EDR (enhanced data rate) that does not require special drivers for XP or Vista. That will ensure you are getting the latest hardware supported directly by Windows. There are also class I and II dongles with different ranges. A class 1 dongle will work to 100 meters. Which ever dongle you buy; you should make sure your version of Windows is current AND you have the most recent Bluetooth drivers for the dongle. Note: Since Bluetooth can be used for networking, if you have a third party firewall it may prevent communication with your computer unless configured to accept data from the module. If you have tried numerous Bluetooth dongles or the generic Windows Bluetooth drivers then installed Broadcom drivers, you may have noticed you can no longer use lower com ports with none Bluetooth devices. This was either caused by mixing drivers or a glitch in how Windows manages com port assignments. Unfortunately the device manager does not show com ports or drivers for devices not connected to the computer but there is a way to see what drivers or devices are still "lurking" around. Left click Start > All Programs > Accessories then right click "Command Prompt" and select "Run as Administrator"
Type "set devmgr_show_nonpresent_devices=1" in the Command Prompt and then press Enter (you might have to restart your computer). Type "cd \Windows\system32" then Enter. Type "start devmgmt.msc" then Enter to start a special version of the device manager. When the device manger window opens, Click View > Show hidden devices. This will display devices that are not connected to your computer including all assigned com ports. Now if you expand the section on COM ports, all the COM ports that have ever been created will be displayed, the non present ones being in grey. You can uninstall away anything that you don’t want (right click, select uninstall). If you remove the com port you have been using you will need to repair your module via the BlueTooth device window. If you like this feature you can change the behavior of the device manager to do this all the time. Right click "My Computer" and select properties. Click the "Advanced" tab and "Environmental Variables". Click "New" and enter "devmgr_show_nonpresent_ devices" in the first field and "1" in the second. Click "OK" three times and the next time you boot the device manager will show EVERYTHING on your system. NOTE: As of this writing, Windows 10 device manager will not display old/used com port assignments created with Microsoft's generic BlueTooth drivers so that they can be deleted. The documentation for PressureTrace specifies the system "should" be calibrated with a load of known pressure. This is to help ensure pressure calculations are correct even if barrel dimensions are off slightly, the gage is glued slightly "askew" and there are metallurgical differences in the barrel steel. There are two key numbers used to calculate pressures. They are called Young's Modulus of Elasticity and the Poisson's Ratio. Young's Modulus of Elasticity: Within the limits of elasticity, the ratio of the linear stress to the linear strain is termed the modulus of elasticity or Young's Modulus and may be written Young's Modulus, or E =(Stress/Strain) It is this property that determines how much a bar will sag under its own weight or under a loading when used as a beam within its limit of proportionality. Poisson's Ratio: If a square bar is stressed in a testing machine in the direction of its length so that the length increases, there is a contraction in each opposite direction, which produces a decrease in the thickness of the bar. The ratio between the contraction at right angles to a stress and the direct extension is called the Poisson's ratio. For typical barrel steels the Modulus of Elasticity will fall between 29000 and 30000 ksi with the Poisson's Ratio between .290 and .305. Unfortunately there is no way a shooter can easily determine the metallurgical properties of his barrel. Even the manufacturer may not have accurate values. To be safe and provide reasonable results, PressureTrace uses 30000 ksi for the Modulus of Elasticity and .30 for the Poisson's ratio. The most common steels used to make barrels are 4140 Chrome-Moly (around 29700 ksi with P.R. of .290) and 416R Stainless (roughly 29000 ksi with P.R. ranging between .290 and .305). If a Remington 700 30-06 produces a peak pressure of 63254 PSI using PressureTrace; changing the Modulus of Elasticity to 29700 ksi will produce a calculated pressure of 62665 PSI. If a Poisson's Ratio of .29 (instead of .30) is also used for the calculations, the pressure becomes 62323 PSI or for a difference of 931 PSI. This only represents a +/- .75% difference. For stainless steel barrels, changing the Modulus of Elasticity to 2900 ksi will produce 61292 PSI; or a difference of 1962 PSI. Changing Poisson's Ratio to .29 from .30 will reduce the pressure calculation to 60960 PSI; however, the Poisson's Ratio for stainless can range as high as.305 in which case the difference to be only 1794 PSI or +/- 1.4% difference. Even the greatest error caused by differing metallurgical barrel properties should be less then normal variations caused by changes to ambient temperature, loading techniques and individual rifle chamber dimensions. Incorrect barrel dimensions or gages not glued perfectly perpendicular to the bore line will produce far greater errors. For accurate measurement of peak pressure it is always preferred to calibrate the system against a load of known pressure by entering a "correction factor" in barrel data. By doing this all variables relating to the metallurgy of the steel, barrel dimensions and gage installation can be eliminated as potential issues. If for some reason you would like to change these default values and own a PTII system, send email requesting instructions. What causes traces with flat tops. If your traces looks like this stop what you are doing immediately. PressureTrace is designed to work within a range of safe pressures at the highest possible resolution. If steel around the chamber expands sufficiently to produce a chopped off trace as shown above, you could be approaching pressures that may eventually swell the chamber. 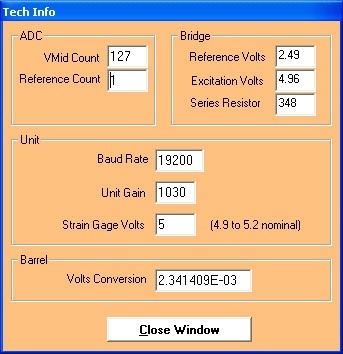 Email us a saved trace file and the voltage conversion number for your module. (The voltage conversion can be found under the "Help/About Pressure Trace" menus and the Tech Info button.) We will double check your barrel dimensions to make sure your loads are safe. Large bore muzzle loader using too much powder and/or sabots. TC Handgun barrels with custom chambers that are too large for the barrel OD. Light bolt action barrels with a fast taper in front of the receiver which have been re chambered for a longer or larger dia. cartridge. You can see from these examples the maximum readable pressures are exceed what should be considered safe in the firearm. A very few rifles such as the Sako TRG-42 chambered in 338 Lapua Magnum have an unusually thin chamber wall and given the high pressure of the caliber, will flat line at just over 50,000 PSI. If your barrel has a thin chamber wall, email for support as instructed above. We will provide an undocumented solution to the problem. What power sources can I use to eliminate batteries? You can use any common 6-9 volt AC wall transformer, however some wall transformers have much higher “ripple voltages” than others. A wall transformer with a high ripple voltage may cause electrical noise that will show in traces. If bad enough; poor wall transformers can damage the PressureTrace module. If your traces do not look like those on this web site and have a repeating "saw tooth" shape, you are probably using a noisy power supply. PressureTrace II is designed so you can also use rechargeable batteries. Rechargeable batteries will not power the module as long as standard batteries, can exhibit rapid voltage drops as they are discharged and have been known to leak. It is not recommended you store the module with rechargeable batteries. After a few dozen charges, rechargeable batteries may also no longer take a full charge or will drop voltage in the middle of a session. The economics of using rechargeable batteries may therefore be questionable. Before connecting any external power supply to the PressureTrace power jack, make sure the power polarity is correct. The power supply must have 2.1 mm power jack with a positive polarity tip (center pin). If polarity is reversed the module may be damaged. There are two issues that may prevent PressureTrace from working for 22 Rim Fire or similar low pressure calibers. First, the cartridge chamber is entirely enclosed in the receiver of most firearms so a gage cannot be glued to the barrel over the cartridge. Secondly, the low pressure of a 22 RF is insufficient to expand most barrels, so even if a gage were glued in front of the receiver, the system cannot sense pressure changes. To use PressureTrace for 22 RF it will be necessary to build a test barrel jig and firing mechanism similar to those used for Piezzo systems. The barrel around the chamber will need to be turned in a lathe thin enough for the metal to expand. The PressureTrace module may have triggered on electrical noise or there is a poor connection. Increase the Sensitivity Level and try it again. A normal Sensitivity is 5 to 7 but the setting may need to be changed for different arms. For single shot actions, use the Pause menu to drop out of capture mode when reloading. Dirty connections can cause issues, especially after the system has been in storage. Connecting and disconnecting plugs will often remove patena from contacts. 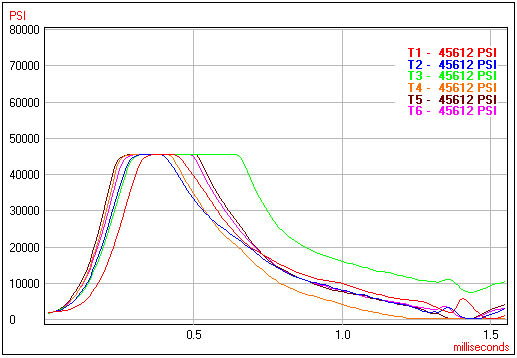 This indicates loss of continuity through the strain gage from the module is most likely due to a problem with the strain gage connection. Check to ensure that the strain gage connector is properly connected to the cable from the PressureTrace module. If you have the test pen provided with every system, plug it into the end of the gage cable and try again. If the system quickly calibrates you know there is good continuity to the end of the gage cable and the problem is in the jumper wire (if used) or the gage side plug. A great product called Deoxit, available at Radio Shack, Amazon, etc. can be used to eliminate oxidation from contacts. If the system has been in storage for a long time contacts should be cleaned by pushing connections in and out a few times or use of a contact cleaner like Deoxit. Moving strain gages is not advised. Removing a gage with acetone will often alter the "gage factor" which is required for proper pressure estimates. If the gage has been glued to a barrel with epoxy it will certainly be ruined but a gage glued with cyanoacrylic glue may be reusable by applying a "Q" tip wet with acetone to the edges of the gage until it releases. When applied to another barrel the gage MAY work but often seems less sensitive. No, and indeed this may not be possible. Attaching gages to the mid-region of the chamber is ideal because this is the area of thinnest steel and greatest metal expansion with minimal interference from surrounding steel of differing thicknesses. On actions chambered for short cartridges the receiver may completely envelop the main case body so you have no choice but to glue the gage over the throat of the barrel. You will still get data but the system resolution will be reduced and traces will not appear as smooth. The resolution difference is especially noticable with short small-bore calibers and a full 1.2" O.D. barrel covering the entire chamber. The edge of strain gages should "normally" be at least 1/4 inch from the case shoulder or front of the receiver. Even if this rule cannot be followed, it may still be preferable to remain over the main case body. You should always calibrate the system against factory ammo or loads of known pressure. Remaining over the main case body, even if a large correction must be entered; will help to ensure the highest possible system resolution. SAAMI test protocols specify transducers should be located slightly back from the shoulder and will vary according to the cartridge. European CIP standards measure pressures 25 mm from the bolt face for most cartridges and new NATO standards measure pressure at the case mouth (gage glued over throat area). Location of the strain gage does not significantly affect readings IF the dimensions entered are correct and the gage edges are at least 1/4 inch away from nearby metal of different thickness. You will get useful traces with gages attached anywhere over the cartridge on a solid barrel. No matter where you place the gage adding a correction will adjust readings to match other systems. PressureTrace uses a standard strain gage although it is smaller than most to fit in tight areas. Connectors and complete gage assemblies with glue are available from our shopping cart. If you have gages already glued to rifles, or wish to buy your own gages you can purchase terminal pads and connector plugs with 4 inch wire leads. Gages should be 350 Ohms, rated to 5 volts and must have a known gage factor (supplied with all strain gages). We use gages from Micro-Measurements, (1-919-365-3800) part CEA-06-125UN-350. PressureTrace will work on shotguns using the "high resolution" pressure setting (0-2000 PSI). When used with shotguns that have unusual metal shapes over the chamber careful calibration against a factory load of known pressure will be required. Once this is done the system will capture accurate PSI data even if a barrel is not cylindrical over the chamber. Most people will get satisfactory results by simply measuring the diameter of a fired case and adding a couple thousandths of an inch for brass "spring back". A few thousandths off from actual chamber diameter should only represent a couple hundred PSI in most rifle barrels, or an amount well within SAAMI factory ammo standards. For extreme accuracy a chamber cast can be taken. Cerrosafe (available from Brownells) or even the old armorer's sulfur mix can be used to make a chamber cast. Formulas are available on the reloading tips page. Another method that works well is to stick a piece of 1" x 1/8" de burred .003"-.005" brass shim stock on the side of a fired case with Super Glue. Put the case in the chamber, and push it forward solidly with the bolt. It will jam before reaching full battery. Insert a cleaning rod down the bore and mark the rod at the muzzle. Remove the rod and case. Place the case on the end of the rod and lay it alongside the barrel. Match the point marked on the rod to the muzzle. Now, mark the case at the midpoint of the strain gauge. Measure the diameter of the casing plus the shim stock. This is your chamber ID at the point where the strain gauge is attached to the barrel. Even in long barrels there is always some pressure remaining after the bullet exits the muzzle. It would be ideal to have all powder burn completely before the bullet reaches the muzzle but that rarely (if ever) happens in an affective load. Reloaders can only work to minimize muzzle flash but it can never be entirely eliminated. 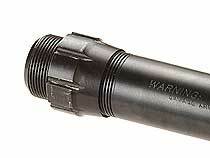 Shoot any firearm at night and the flash you always see is indeed that part of the pressure curve. Each successive generation of PressureTrace has more efficiently used battery power. The USB PT modules drew most of the power required to run the system through the USB connection so the internal battery lasted up to 10 times longer then earlier RS-232 designs. The original RS-232 modules operated continually from a fresh 9 volt alkaline battery for six to 10 hours. The new PressureTrace II systems are by far the most efficient and the bank of 6 AA batteries should provide sufficient power for up to 130 hours of normal use. With any of the systems the amount of time batteries will last is greatly influenced by the user. Important Note: As is evident from the specs below, waiting to capture shots is always the highest power consumption mode. Later software has a "Pause" menu that displays when the system is waiting for a shot. Selecting the menu will drop the system out of capturing mode in the middle of a shot string. A benefit is when continuing the system will first recalibrate to static current flow as if a shot was just detected so any cooling of the barrel (and change to current flow) is eliminated from the next shot. Quiescent Mode - The PressureTrace module is running, connected to a strain gage and awaiting a command from the software. When the module is in Quiescent mode, the PC software message window will display “Press SHOOT when ready”. This is the lowest power consumption mode. RS-232 - In this mode the module will draw 38 to 40 milliamps from the battery. USB - In this mode the module will draw approximately 30 milliamps through the USB cable and PC battery. Internal 9 Volt battery usage is negligible only to maintain the USB connection. BlueTooth - Even without power draw from the PC via USB, the wireless PressureTrace II module only consumes 8 milliamps in this mode. Capturing Mode - The module has received a command from the software telling it to capture and return pressure traces. When the module is in Capturing mode, the PC software message window will display “BARREL NAME Waiting for a shot”. When you reach the end of a shot string, press the End Shots button on the PC software screen. This will return the module to the Quiescent mode. RS-232 - In this mode the module will draw 47 to 52 milliamps from the battery. USB - In this mode the module will draw 14 milliamps from the internal 9 volt battery. BlueTooth - Bluetooth transfer rates are so quick, despite slightly higher power consumption during transmission, power consumption during this mode is not significantly higher then the USB model. Windows XP SP2 or newer contains the system files needed to run the PressureTrace II software. Older versions of Windows are no longer supported by Microsoft. Windows 2000 may be compatible with the PressureTrace II software but you will be required to run third party Bluetooth drivers. Once you click the shoot button, PressureTrace immediately starts waiting for a shot. To eliminate false triggers the current through the strain gage must exceed the trigger level (sensitivity setting) and stay above that level for a short time before the system will accept the the shot as valid. No data is lost. With the trigger level set to only 2 (as in this example) a slight mechanical difference in the action added several microseconds of data to the first shot. Increasing the trigger level to 8 eliminated the delay. Ignition delays due to the wrong primer, low load density and powder selection are often real! Especially with large bore heavy rifles and extremely slow powders. If increasing the trigger level does not eliminate delays, they are probably real and you should try other component combinations. PressureTrace regulates current flow but on rare occasions old, used or defective batteries have caused traces with a "saw tooth" appearance. Replacing the battery with a fresh one should eliminate jagged traces. To date every occurrence of this problem has been when using Duracel brand batteries. PressureTrace is warranted against all defects. If you suspect your system is not working properly email RSI using the links below. For more information about our warrantee policies, click here. 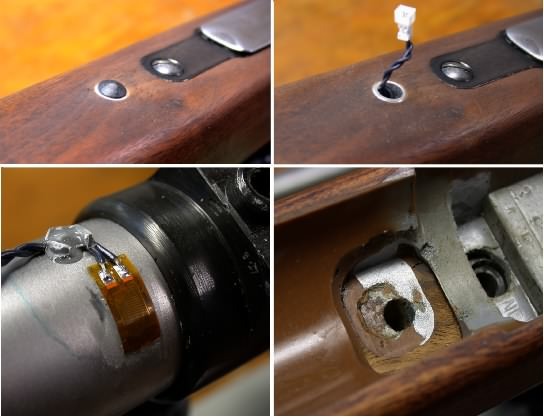 Strain Gage Cable Damage - Bending the strain gage cable with sufficient force to break shielding and internal wires or damaging the cable with recoil because it has not been properly secured to the rifle will cause the system to no longer calibrate so it says "waiting for shot". The low capacitance cable is fabricated from quality material and will last indefinitely if it is not abused. When stowing PressureTrace, coil the cable loosely. Do not put kinks or sharp bends in the cable. If you have damaged the module cable replacements are available on-line. Loss Of Calibration - Each PressureTrace module is individually calibrated for circuit voltage gain. A slowly failing chip could alter the current flow through the module. Here is how to verify your module is still properly calibrated. Launch the PT software with the module connected to your PC and the test gage on the end of the gage cable. Push "shoot" and confirm the module calibrates. Click "End Shots". Select the "About PressureTrace" item under the help menu. A window should open with a description of the module; its firmware, etc. Click the "tech info" button. The window that opens should look something like this. The numbers will vary slightly for each module but should be close to this example. Most importantly the unit gain should be within the range of 800 and 1400, If the unit gain is not within this range or the top five items are not close to these, contact RSI. We do not believe encapsulated gages are particularly unsightly or interfere with normal field use, especially when attached to the top of a barrel under a scope bell with excess tape carefully trimmed. Altering the stock of a fine rifle may reduce its value. Before making modifications to a stock consider the alternatives. A gage can be applied to the side of a barrel and hidden by the fore stock so only the wire and plug is exposed. Even if this requires removal of some wood, the alteration will not be visible on the exterior of the stock, should not interfere with bedding and will not significantly reduce the rifle's value. If you wish to alter the stock of your rifle this is the slickest modification we have seen so far. Denton Bramwell made the modification to a rifle he uses regularly for pressure testing. The black cap is just a small hole plug from the hardware store. The white ring is an aluminum spacer, or ferrule, from his electronics junk box. When he wants to capture data, the plug comes out, and the gage leads are available. The extra gray blob near the gage is JB Weld, serving as a strain relief. (when using our bare gage assemblies this is achieved with a terminal pad) You can see the remains of the green marker he used to identify the area needed for the gage, strain relief blob and coiled wire. While prepping the gun for bedding he used modeling clay over this area to mold a "nice little pocket" into the bedding compound. For this to work the cartridge case must be long enough to allow sufficient room in front of the recoil lug area. Denton also writes the gage factor on the under side of the barrel...certainly another good idea.